Here at Dorchester Collection, it brings us great pleasure to reveal our latest suite at Le Meurice: the new Pompadour Suite. But beyond the décor, there is a fascinating history surrounding the suite’s inspiration and namesake – the Marquise de Pompadour. This newly renovated suite brings all the hallmarks of modern luxury living and effortlessly combines them with the elegance and grandeur of 18th century décor. The result is both authentic and subtly contemporary. 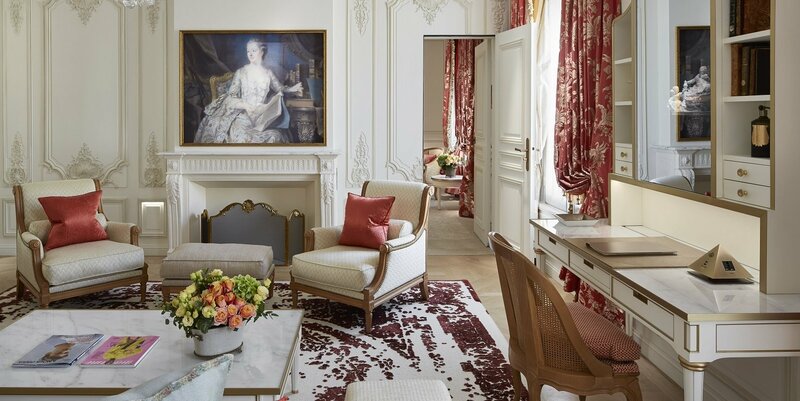 But beyond the décor, there is a fascinating history surrounding the suite’s inspiration and namesake – the Marquise de Pompadour. The Marquise de Pompadour was the long-standing mistress of King Louis XV of France. It’s rumoured that she first attracted the king using art, decorating her apartments with lavish furnishings and paintings by her favourite artists. Everywhere were signs of grand luxury that began to define this era of French style – from the porcelain ornaments to the rich tapestries. Proudly positioned above the fireplace, a portrait of the Marquise herself takes pride of place, surveying the room she inspired. 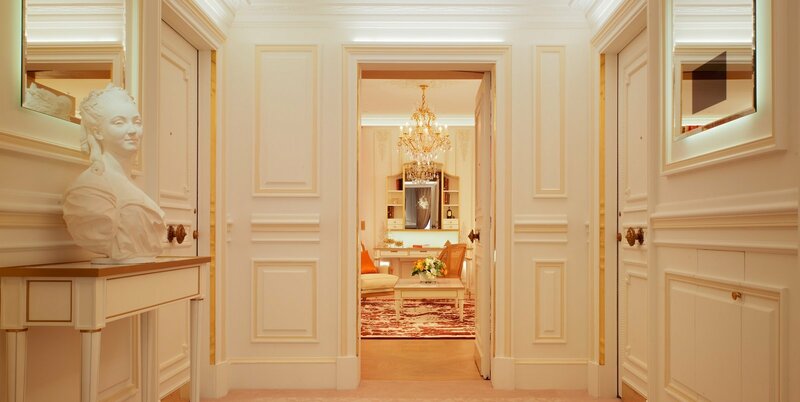 When creating a new suite for Le Meurice, it seemed a fitting inspiration for a hotel famed as an 18th century palace hotel. Furnished with luxurious silk by Prelle, trimmings by Declercq and striking chandeliers by Lucien Gau, there is more than just a hint of the Marquise’s elegant touch. 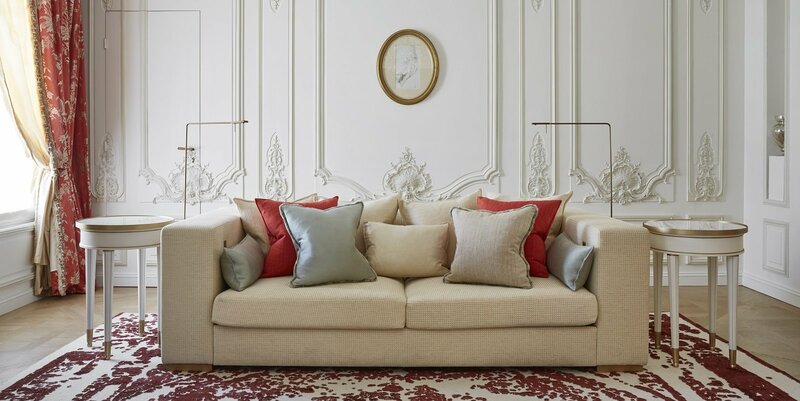 Renowned Parisian interiors artist, Charles Jouffre, designed the upholstery to create a sumptuous experience for every guest, featuring luxury Garnier-Thiebaut linen and Mühldorfer pillows. Deep reds and plums, bold brasses, rich hardwoods, and creamy beiges are the suite’s trademark themes, creating a relaxing, yet bright and modern atmosphere. Despite the historic flair, modern technology brings the suite to the 21st century. High-speed Wi-Fi, a 55” Bang & Olufsen television in the living room, and a waterproof television in the bathroom are just a few of the state-of-the art features guests can expect for their stay. If you’re planning a city break in Paris, why not make your next visit a memorable one with a luxurious stay in the Pompadour Suite. Interiors supremo, architect, painter and garden landscaper, Thierry Despont is a man who relishes new challenges. This year’s Milan Design Week (April 8 – 14), promises to be an explosion of creativity. From hidden courtyards to incredible terraces hosting pop-up events, you’ll find all the design inspiration you need. Renowned architect and artist Celeste Dell’Anna is the creative genius behind our highly sought-after Imperial Suites, affectionately referred to as ‘The Artist Suites’. Hear how he put his heart and soul into suite living at Hotel Principe di Savoia. Our 45 Park Lane hotel opened in September 2011. Eight years on, we asked Thierry Despont, the designer behind the hotel’s distinctive look, to look back at the hotel’s exciting creation. For the journey of a lifetime, take to the open road in a supercar from picturesque Paris to majestic Monaco, in time for the world-famous Monaco Grand Prix. Francesca Basu, a leading London-based architect and interior designer, shares with us her love of Milan. Read how the city, especially La Scala, inspired her luxurious design for our Principe Suites at Hotel Principe di Savoia. For expert advice on easy ways to improve your photography and enhance the look of your social media posts, our #DCmoments City Guides authors share their handy hints for fabulous photos. It’s our favourite time of year, when you’ll find plenty of fun festive events happening in each of our exciting destinations. As our own expert insider guides, our concierge teams are happy to share their favourite ways to celebrate the holidays, from music concerts in London to festive movie screenings in LA. View the latest issue of Collect, our bi-annual magazine featuring a curated mix of culture, art and lifestyle, together with the latest news from Dorchester Collection hotels.